An artist's illustration of SpaceX's Dragon space capsule in Earth orbit. The United States needs to ramp up commercial space exploration and scale down NASA's role in flying humans to low-Earth orbit, a conservative organization says. Members of the group called the Competitive Space Task Force argued at a press conference in Washington yesterday (Feb. 8) that the country must be far more aggressive in stimulating commercial opportunities and competitiveness in space, while government-led space exploration should focus on more-advanced goals such as nuclear-powered rocket engines. "I think the philosophy that the only way to space is through NASA's front door is simply outdated," said group member Robert S. Walker, a retired congressman (R-Pa.) who chaired the House science committee. "As long as NASA sticks to the idea that their primary goal is to get from Earth to low-Earth orbit, we will have a problem." Instead NASA should leave that job to the commercial sector, where companies like Space Exploration Technologies — the Hawthorne, Calif., company commonly known as SpaceX — are already starting to pick up the slack with their own private spaceships and rockets, Walker said. The group, which describes itself as a coalition of fiscal conservatives and free-market leaders, said renewed focus on the commercial space sector could not only save costs for NASA but reduce dependence on Russia and its Soyuz spacecraft to carry U.S. astronauts to space after the space shuttles are retired this year. "America cannot simply sit in the passenger seat and expect to lead. We need to pilot the ship. We need to lead the way," said group chairman Rand Simberg in a statement. The Competitive Space Task Force plans to make a series of recommendations to Congress, including the advice that NASA use fixed-price, pay-for-performance contracts with private businesses to reduce the costs of its programs while opening up new commercial opportunities. It also advocates making the U.S. segment of the International Space Station more accessible to commercial companies for scientific research. "One has to look back at the history of exploration worldwide," said task force member Andrew Langer of the Institute for Liberty, an organization that promotes small government. "State-sponsored exploration always gives way to private-sponsored exploration. It's the entrepreneurs that always carry it to the next level. And we are at that point now." The task force's briefing occurred during a busy time for the private spaceflight industry. On the same day, long-time NASA contractor Alliant Techsystems announced a partnership with the European firm Astrium to convert part of NASA's Ares I rocket — whose role in space was canceled by President Obama last year — into a commercial launch vehicle. The press conference also occurred the day before the Federal Aviation Administration began a two-day conference in Washington on the opportunities and challenges for private space vehicles. NASA is already in a state of transition after Obama scrapped the space agency's moon-bound Constellation program and instituted a plan to target an asteroid and Mars. 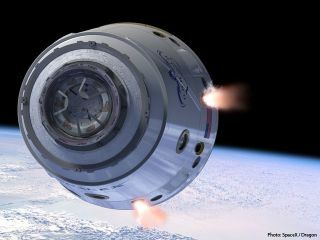 Obama has spoken about spurring commercial spaceflight, but members of the task force say he should do more. In October 2010 the president signed into law a NASA authorization bill passed by Congress that represented somewhat of a compromise between NASA's old path and the administration's plan. Since that bill has not passed through congressional appropriations, members of the Competitive Space Task Force said they have hope it can still be altered. "Much of what ended up in the authorization bill last year was the work of relatively few people," Walker, who represented the western outskirts of Philadelphia for 20 years, told SPACE.com. "If we can make more people a part of that discussion, we think that changing the direction of the policy is very possible going forward."